Please call if you need these bags imprinted with your Company Name, Logos or other information. 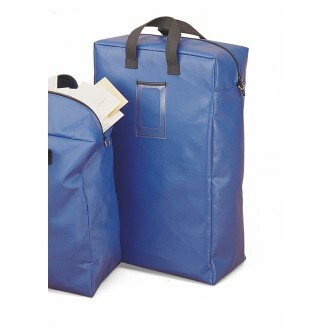 Other size bulk mail security totes are available, click on Part 84 (for Small) and Part 86 (for Medium). • Gusseted end panels expand to hold more than ordinary bank mail bags. • Durable vinyl mailbag with double stitched seams to give you long lasting dependability. • Resistant to dirt. grease and moisture. secure mailbag. See link above for optional padlock and cable tie / fastener. Plastic window allows room for an 5"H x 3-1/8"W optional address card. See link above for optional address card. Window cut-out is 4"H x 2-1/4"W (centered in window). Need help or have questions? Contact our sales department.